In the summer of 2006, top players scattered all throughout Germany came together to form one fully democratic organization that would compete in the Yu-Gi-Oh! Trading Card Game (TCG). Their sole purpose was to dominate the Premier circuit within their country and become Germany’s finest. Thus, United Gosus (UG) was born. Today, United Gosus is truly an international organization, featuring talents from Europe, North America, Latin America, and Asia. 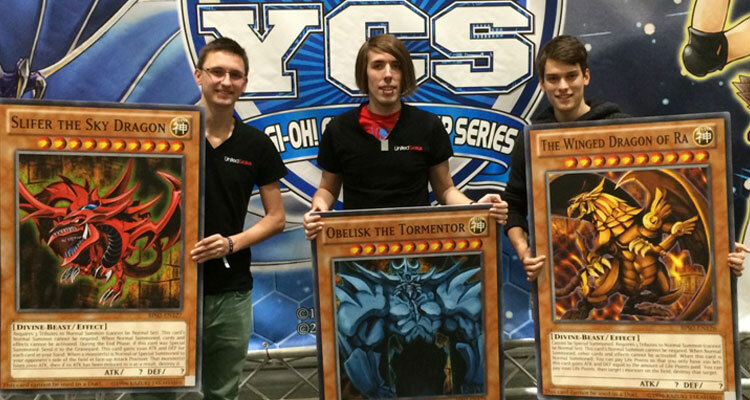 Our “trophy case” consists of titles from every Premier level: YCS, WCQ: National, WCQ, and World Championship. Perhaps now, United Gosus can be considered one of the World’s finest. But, that really isn’t up to us to decide. Much like the players that make up our organization, as well as the Yu-Gi-Oh! TCG itself, United Gosus has matured over the years. We are not simply concerned with continuing consistent Premier success and pushing our members to that next level. We also want to push the entire global player base to that next level. We do this by sharing information about our experiences and thought processes from Organized Play events, offering analysis and encouraging discussion of the happenings and trends of formats, and by sharing useful resources. We also openly invite the entire community to join us in celebrating our successes. All of this is only accomplished through our portfolio of socially integrated media outlets and in collaboration with our sponsors and affiliates.